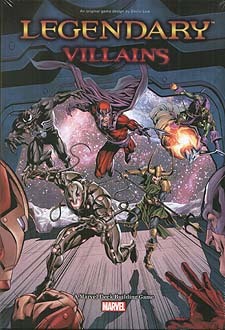 Legendary: A Marvel Deck Building Game has been turned upside down in this stand alone core set, Villains. Play as your favourite Marvel villains as they take on the best heroes in the Marvel universe. Build your deck with Magneto and the rest of the Brotherhood or try your strategy with Sinister Six! Villains is fully compatible with all Legendary sets, making the team up possibilities limitless. 500 playable cards with ALL new content! An expansion/stand alone game and in my humble opinion one of the best deck building games out there - Legendary Villains takes everything that was great about the first game and gives you a whole lot more. Here, you get to play as the bad guys like Doc Octopus, Electro, Venom, and others. In the original Legendary base game there was a "Mastermind" which was the enemy the players must defeat in this version there is a "Commander", the other changes from the first game is - Madame Hydra replaces the SHIELD Officer, Bindings replace Wounds, Overrun replace Escape, Hydra starters replace SHIELD starters, etc... One cool innovation is the New Recruits card this is cool because when it comes up in your hand it gives you +1 fight, you can then replace the New Recruits card back on its deck on the mat, draw a new card, but keep that +1 fight that turn. The other new innovation is the ability to Dodge which appears on a villain card in your hand this allows you to discard that card and draw another one. The bit I am really impressed with when compared to the first Legendary, is the play mat. The first game came with a really nice board with special places for all of the cards, however we have played our copy so much that it really is starting to show significant wear and tear and in fairness that didn't take long. If you like deck builders then I highliy recomend that you pick up either the original game or Legendary Villains (you do not have to have the first game to enjoy this one!). I would say that because the game has such a massive theme MARVEL all over it if you aren't into it then you may not fully appreciate the game. For people new to the hobby or new to deck builders considering purchasing one I'd recommend buying the Legendary base game purely because there are more expansions out for that one so more variety. This is one of my favorite things about the Legendary system, the game never gets "samey." Due to the variety of cards and the different Plots every time, you'll never play the same game of Legendary twice. I am sure Upper Deck have plans for releasing more expansions for Legendary Villians in the near future.